Simple and easy to use. Buy one! What a great kitchen gadget! 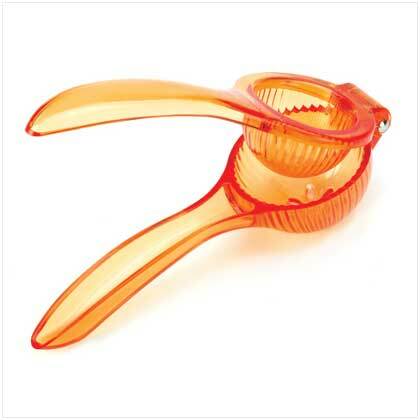 Small, lightweight, and cute, this Hand-Held Plastic Citrus Juice Squeezer is priced just right for you to make fresh squeezed orange juice for breakfast. Use it as a juice extractor for lemons and limes to make your favorite lemon bars or meringue pies. Plastic material Is lightweight and easy to use. Citrus press Provides a basket to cradle the fruit. for squeezing quickly. Small size Is easy to store.